Does your little one drool a lot? Or maybe you just like to dress your baby in style. Either way our bandana bibs can fit your needs. 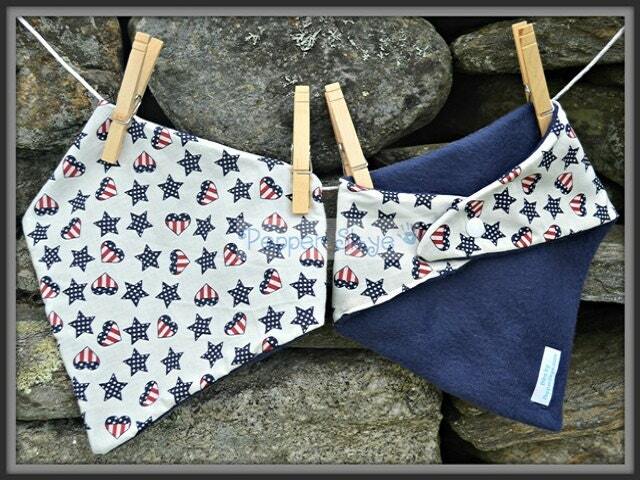 These stylish bibs are backed in fleece to help keep those shirts dry. Fits most from 4 months to 2 years. If you're a busy mom like me changing shirts and having extra laundry only adds to your work. So get your bandana bib from Pepper Skye today! This bib has a patriotic as well as country look to it. Great for year-round and to dress up a 4th of July outfit! The front has small hearts with a flag design and navy blue stars with white stars in them on an off-white background. The back is a navy colored fleece with a coordinating plastic KAM snap.